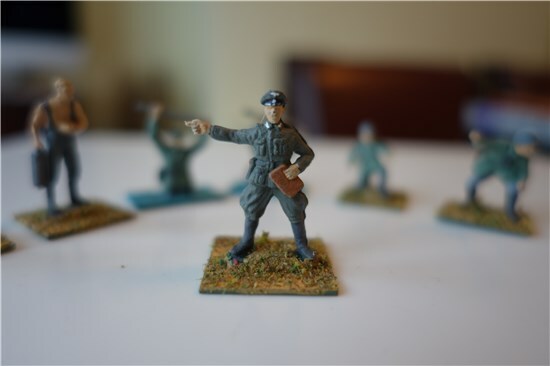 Operation Omega is an attempt to complete everything outstanding (model-wise) scattered across the wargames workbench. 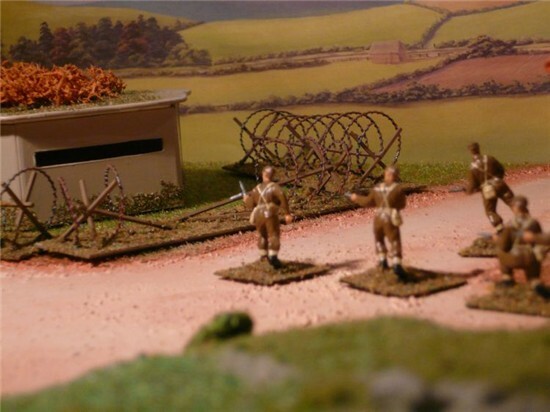 I have had the Horsa glider on the right for some time but wanted a second to be able to stage a really good raid game - Pegasus Bridge is the obvious one but there are others. I picked up a second kit at the Duckworth Air Show a couple of years back and have only now completed it. On the right, you can see that the aircraft is fully crewed. In the other cockpit, the co-pilot is reading a map!! 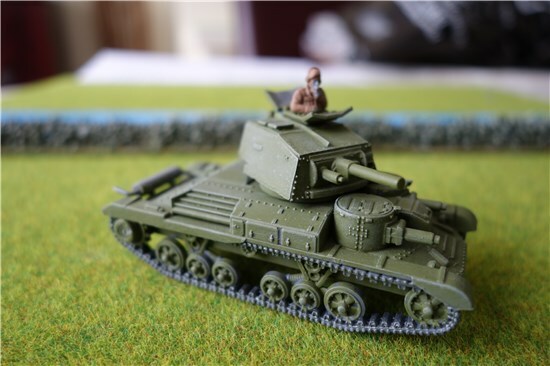 I have a Churchill tank with a spigot mortar to complete and then will move onto the German Gunboat (see earlier posts). 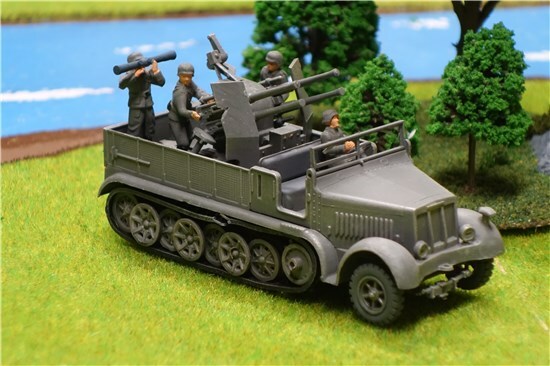 I might then treat myself to some of the new Plastic Soldier Company Sexton SPG's but am resisting starting anything else until Operation Omega is complete. 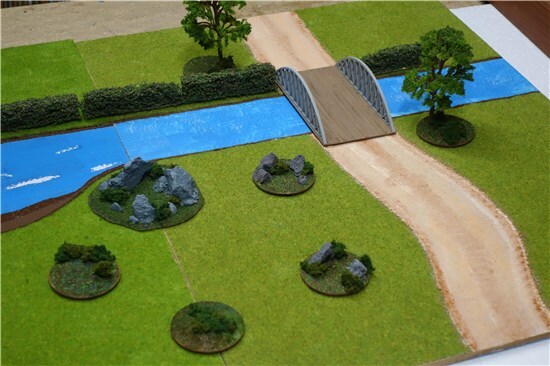 Above left - the new pieces placed on a couple of terrain boards to show their effect. 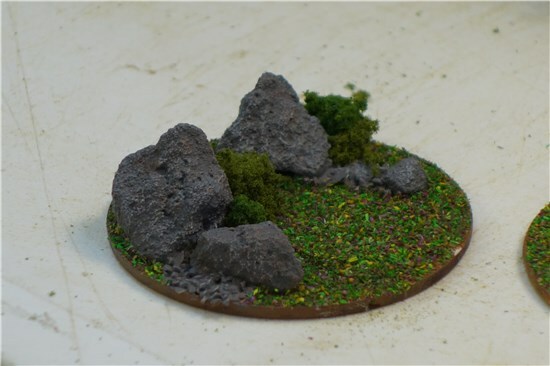 Above right - I have called this "Mel's Mound" because it was the first real piece of scenery built using his techniques. The base is card and the lumps of rock are from the same collection of old wall plaster cast-offs. 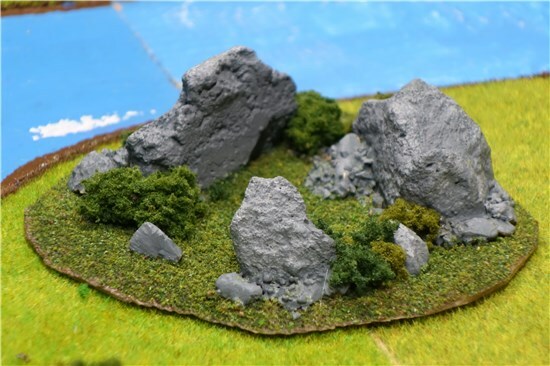 Mel The Terrain Tutor would be proud! Having acquired some 60mm MDF bases (2mm thick) and followed the Back To Basics videos from The Terrain Tutor (Mel's a good bloke!) , here is the result. The rocks started life as bits of old wall plaster bashed out of a job whilst the base is covered with Mel's usual paint/PVA mix. Flock and clump foliage make up the rest. A simple job - the 6 bases took about an hour with a couple of overnight drying sessions. The trees are e-Bay cheapies from overseas covered in flock. 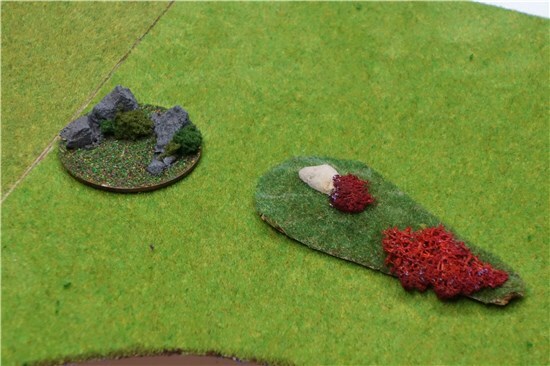 Ideal ground cover pieces for troops to hide in and to represent "broken ground". A new set of rules and some new pictures for the launch. Enjoy! Top left - Grille 150mm SPG, top right - Radio exchange vehicle, centre left - Humber Light Recce car, centre right - L40 47/32 SPG, bottom left - Panger III H, bottom right - SdKfz 7 with Quad 20mm Flak. (I will add manufacturers etc when I can work them out!!! 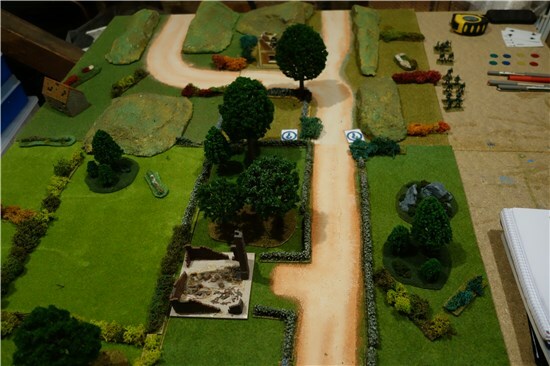 Here are some pictures of the recent Ambush scenario played out to get myself back into gaming. Here is the board - just 4ft x 3ft. The US Recce Troop arrive from the bottom and need to investigate the route North, top centre (or center I guess!). Note the rules, cards, counters and assorted 'stuff' need to play the game on the right!! 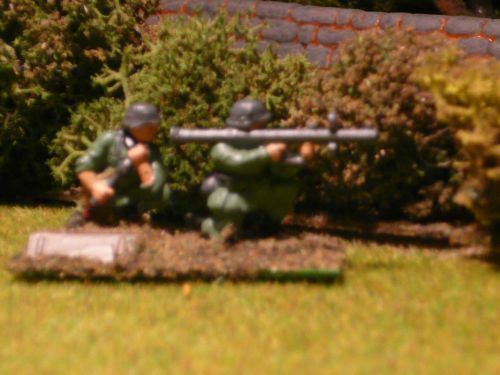 The enemy - an 8-man infantry company from Valiant with the addition of a Panzerfaust, 2-man PanzerSchrecke team and a 3-man MMG team. 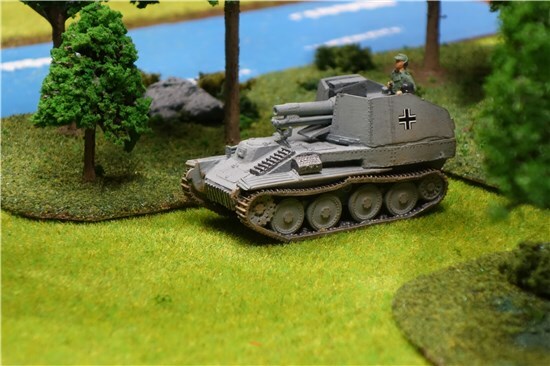 Despite all this fire-power, when the PanzerSchrecke team were rumbled and taken out by the M8, the remaining infantry had nothing to combat the armour and just ran out of bodies before they could do serious damage to the US infantry. Note the "concealed element" card behind them - this was one of 3 places the PanzerSchrecke team could have been hiding. This is the last hurrah! for the old hill lumps - my next job is to make some terraced ones that figures can stand on. Well alright - not really but the pressure and stress has been fantastic over the past couple of weeks as version 5 of FYOB has come closer to publication. Checking, double-checking, reading and proof-reading, cross checking references and endless spell-checks have been undertaken to try to make v5 the best yet. Not just in terms of playability but to remove some irritating typos that crept into v4 - despite the many checks!! 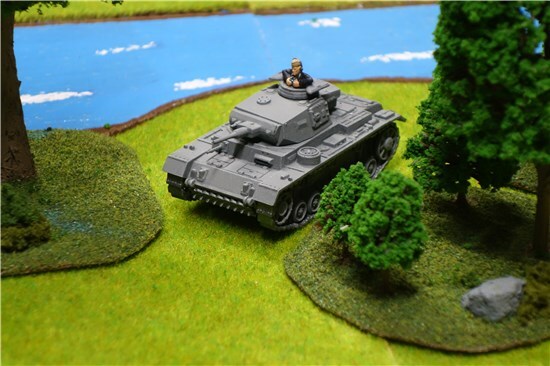 On the 7th Augustm v5 was launched and I hope that the slight changes to the game play and the big change to the Order Dice rules will be well received. To be honest, the new rules have been in use on my table for some time but I needed to make sure that I wasn't just changing things for changes sake. The new rules had to be better - and I think that they are. I'm working on a free pdf download for existing FYOB users that show these changes and that should be available on the website soon. The end of May has seen a few spare days and the chance to finish painting and basing all the odds and bits that needed doing. Apart from some wall sections (left), there are a number of motorcycles in the right foreground, artillery bases for 25pdr and 50mm AT guns (centre top and lower) and some new Austin 10 Utility cars ("Tilly"s) in the centre. 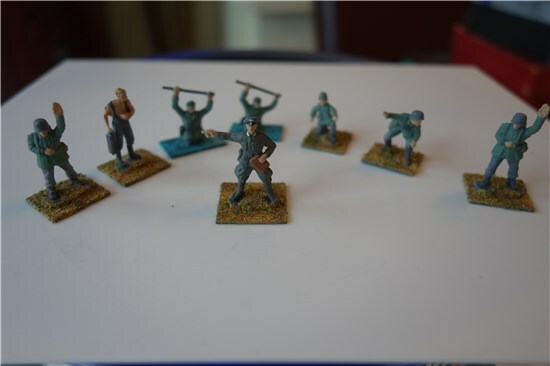 Here are the 8 figures selected to make up the Engineers Company for the German Pontoon Bridge. Note the two figures up to their waists in water!! The officer has his insignia painted on and I am really pleased with the outcome. However, I won't be going back to do the existing officers in other formations! Finally, a quick update on the German trawler. I have decided to replace the damaged cowl ventilators with new cast plastic parts from Caldercraft and have also removed all of the moulded ladders and stairways. 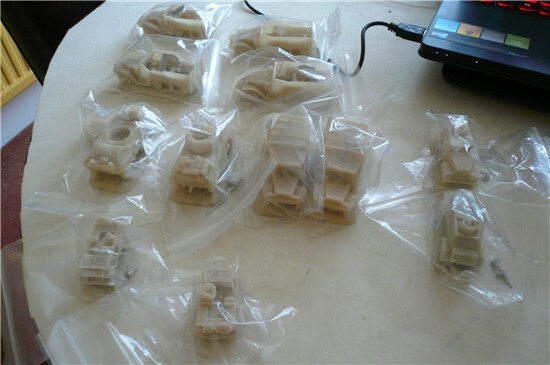 The replacements are cut from plastic mouldings. The aft mast is also shown, made from plastic tubing and replacing the bent original. 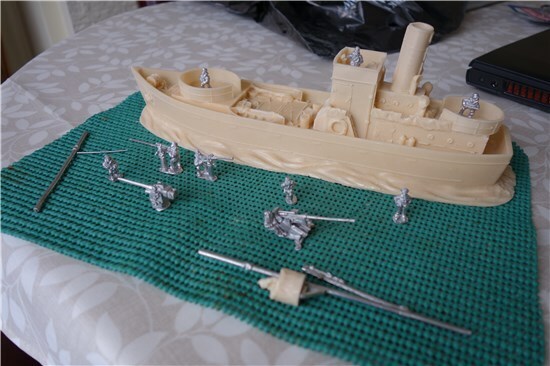 The hull has also had another couple of hour's worth of work removing excess resin. Warning - resin is nasty stuff - always wear a mask and work in a ventilated area. 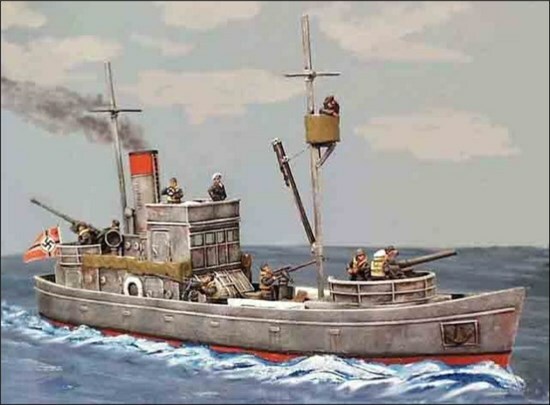 This picture, taken from the Britannia Miniatures website, shows the German Armed trawler model (AMP13) that proved too tempting at the "Colours" show last year. For silly money (£35 I recall), you get the resin hull and superstructure, all the crew, guns, masts, everything to make what you see here. 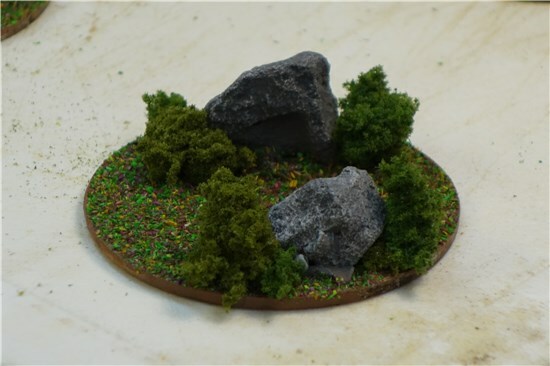 The model sits on a base that is about 15mm bigger than the hull and is formed into waves so it's easy to paint to fit into your scenery boards. I guess, with a bit of surgery and a steady hand, you could remove the base and create the option of having the vessel in harbour. Getting home from the show, I put this away and only came back to it some 15 months later. 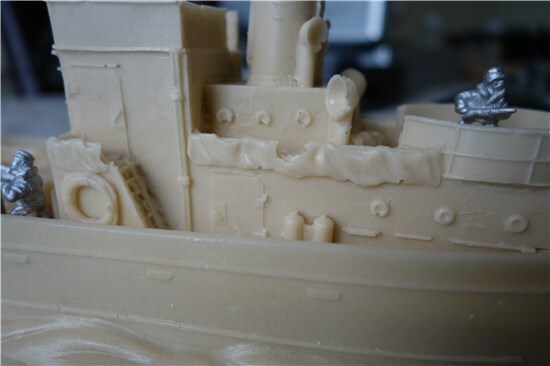 This is what the bubble wrap revealed - a resin cast hull with the superstructure piece (comprising the cabin, funnel and rear gun deck) as a separate piece. The masts are white-metal as are the guns and crew. 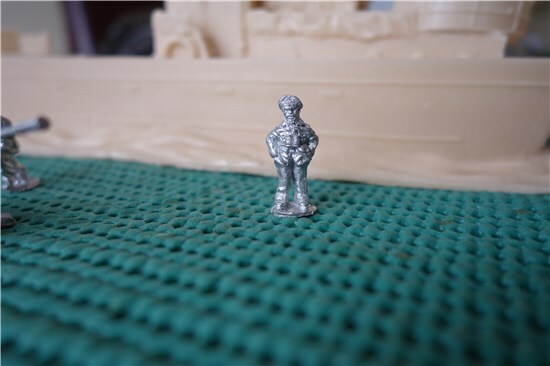 The man in the crows-nest is a resin casting. The fore mast/crows nest and the guns are shown here part assembled. The aft mast was very bent and so I will replace this with a plastic version using StripStyrene from Evergreen. You can see (above left) that the captain is quite a little character whilst the guns are decent castings with very little flash. The crew are in "action" poses. 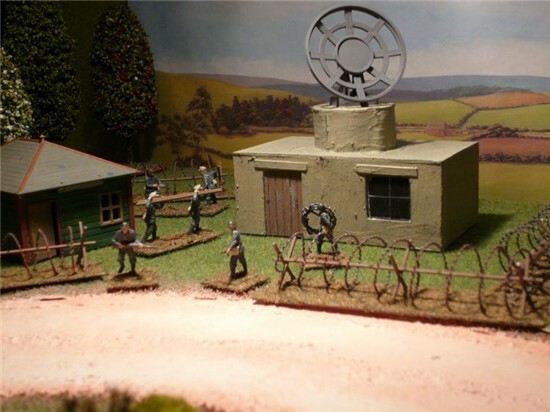 There is also a junior officer for the bridge using a signalling lamp. Some of the resin didn't travel/store well. These missing pieces will have to be replaced with Milliput modelling putty. The ventilation bells (not sure what they are called ) will be replaced with cast parts from my local model shop which, luckily, stocks lots of ship bits. This is certainly not going to be a quick project that I can knock out in a couple of evenings!! 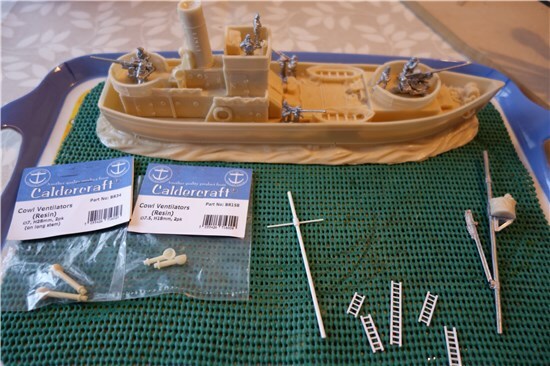 Not only am I a ship novice, but there is a lot to do with this kit. I have spent about 2 hours cleaning up and sanding the hull and superstructure already to get a decent fit and I reckon I have another evening of filling and sanding ahead of me. 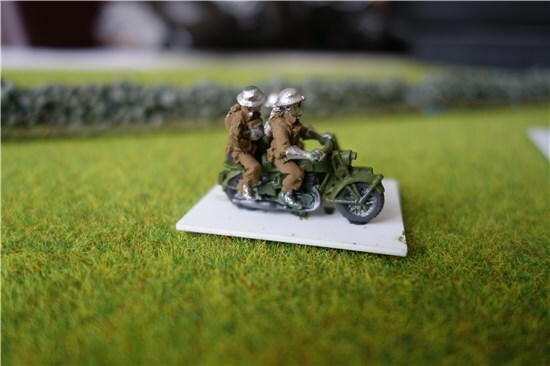 A tiny SHQ kit (actually a pair of kits) representing one of the contributions made to the war effort by the Norton motorcycle company. This is the Norton motorcycle combo capable of moving 3 troops and a medium machine gun. 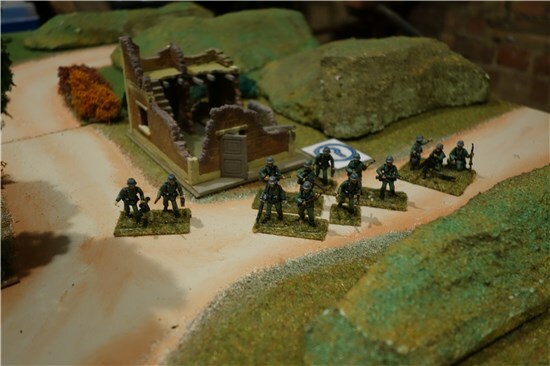 They appeared in recce formations and will do so again in my Operation Sealion games. The men are not fully painted here and the vehicles need basing but they are fun to build (4 parts plus the men) and a pig to paint!! 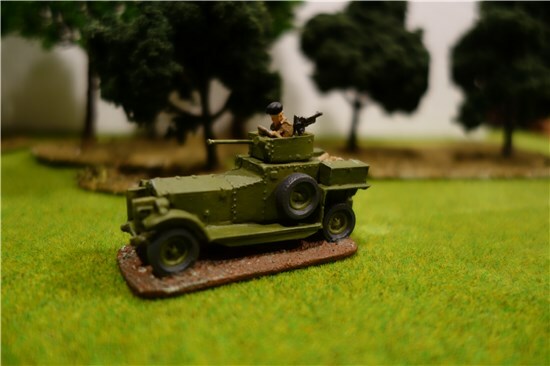 Plastic Soldier Kits make a British A9 cruiser which I wanted for my Operation Sealion games. You get 3 in a box and they are an easy build with only about 12 parts. 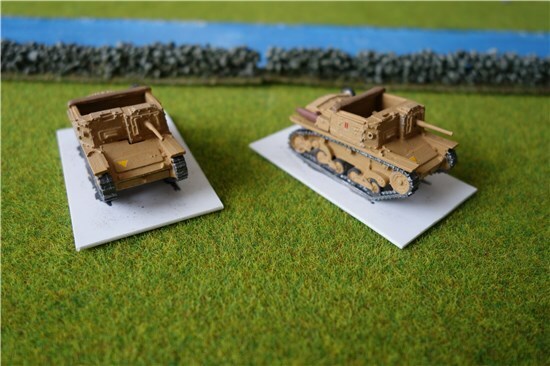 The kits give you an option of the standard version (shown above left) or the desert version with a side skirt covering the rear of the tracks (to minimise sand/dust clouds). 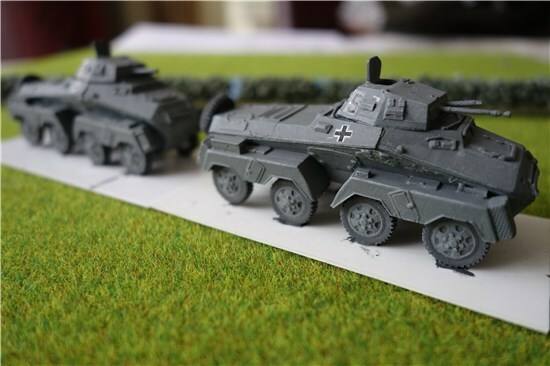 You also get the option of building the turrets with a different mantel and a 95mm gun to represent the CS version of the tank. Unfortunately, I wanted 3 of the normal versions and a CS version so the only option was to scratch-build a revised turret. The result in shown above right. 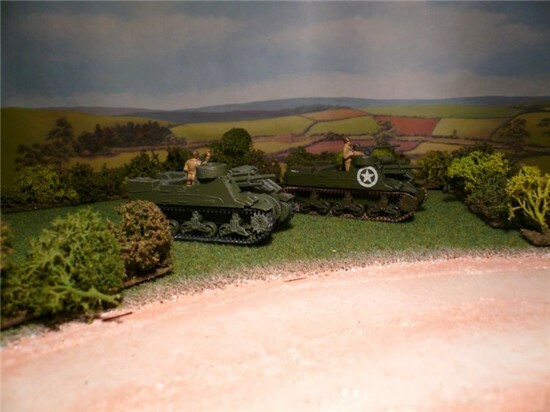 The turret on the right is the one from the kit. Using 40 thou plastic card and the original turret as a template, I cut out a set of turret sides, a base and a back plate. Before fitting together, I used a sharp implement (a pointed centre marker) to create the rivets. 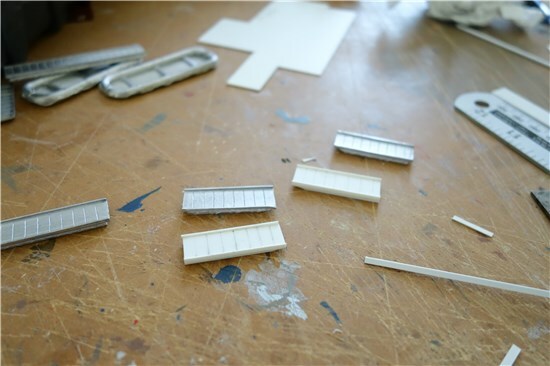 Lay the plastic card face down on a wooden surface and position the pointed device on the back where you want a rivet. Tap sharply, but not too hard, with a light hammer. Turn the plastic over and you will see that you have a pimple - a rivet - easy!! Now just repeat for another 50 or 60 rivets that are needed for this turret!!! 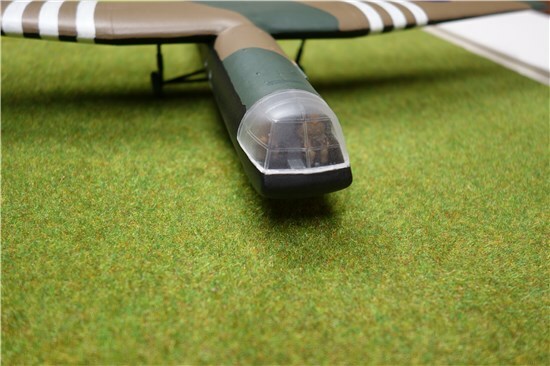 The side vents are made from slivers of plastic strip and the turret ring is a penny fixed to the turret base with superglue. The escape hatches on the top of the turret came from the scrap box. The aerial base on the rear of the turret is a section of Plastistruct box section cut at an angle with something from the scrap box on top. I think the "something" was an oil can or similar?? The turret join running laterally along the top of the turret is just a strip of plastic. 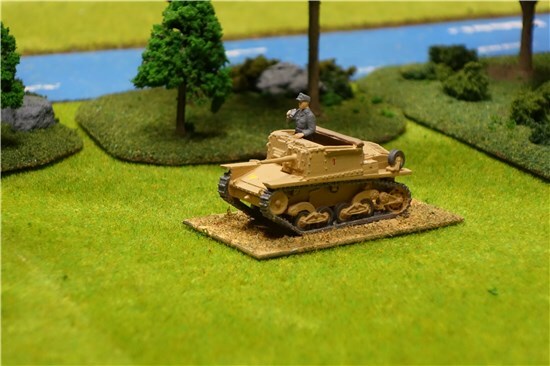 The open hatch and the commander came with the kit as an optional extra when building the tanks. (I have 2 more for future use in the spares box now). There is no location pin - the turret just sits on top of the chassis. The final model is shown below. The "Rapid Fire" boys are linked with Ready To Roll models and the link from the RF website is worth following. 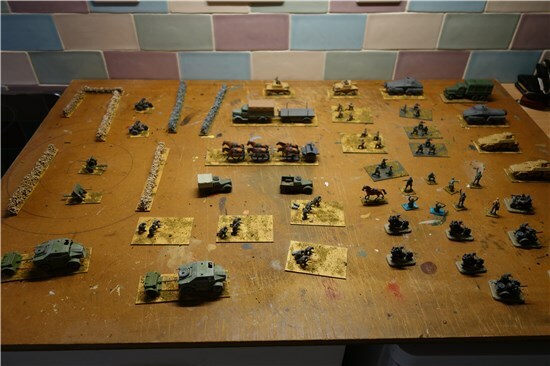 I recently ordered a few bits as part of the project to bring the US army up to scratch. Here is the order as it arrived, well packed and complete as usual. 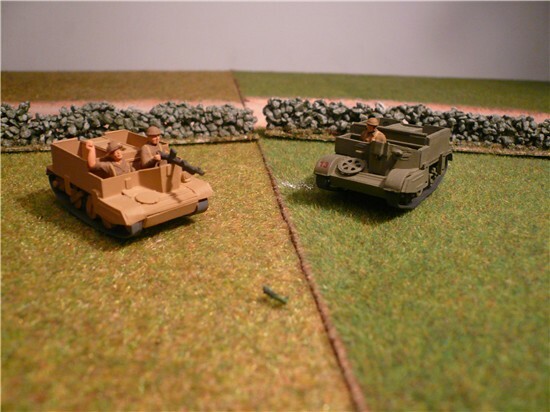 At the back are 4 M5 half-tracks and in front of them are a pair of M8 (37mm) armored cars (US spelling!) and a couple of 1 1/2 ton weapons tows. 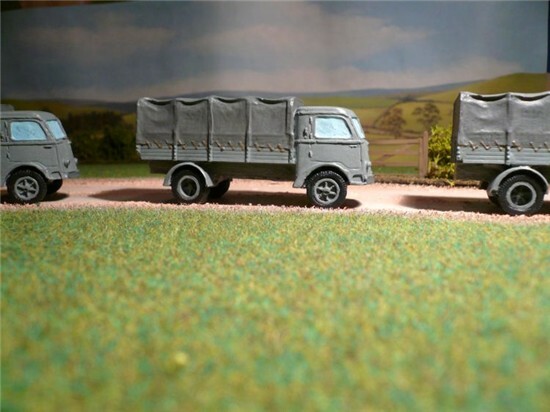 In front are a pair of jeeps with drivers - separate heads for the drivers in whitemetal make this a VERY useful kit. 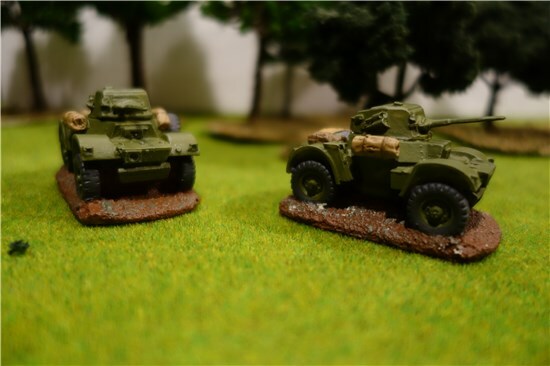 To the right are 2 Humber Light Recce cars which will end up in British service. 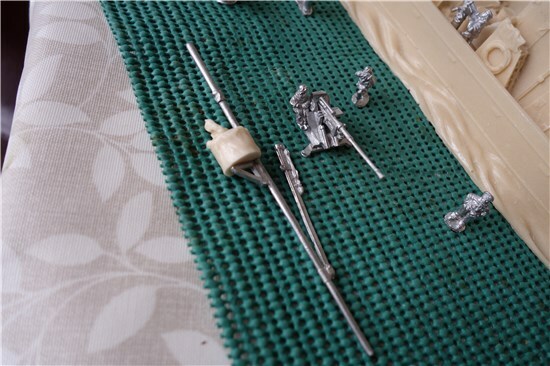 You can just about make out that the weapons tend to be whitemetal and separate from the resin body of the vehicle. 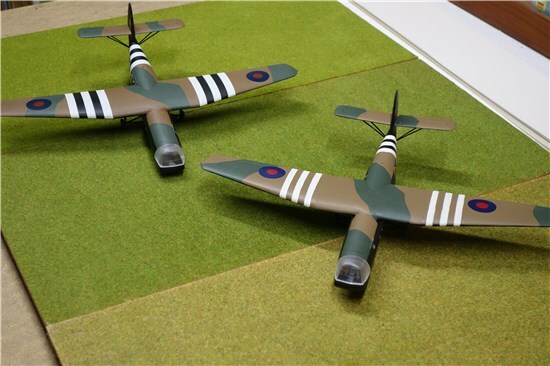 This requires a bit of careful work with the Superglue and the bodies themselves can have a little unwanted flash from the moulds but generally this is light and these kits should not be beyond the most average of modeller. Remember to wear a mask when filing resins and always wash your hands/the model afterwards. The Ready To Roll website has product pictures so if your resource library or the Internet fails to turn up a colour reference, the website can help. This lot costs about £60 - about the same as you would pay for a small OO gauge locomotive for a railway layout and about half the cost of 12 wagons. Good value when you consider the fun that can be had. More pictures to follow when they have been through the paint shop. In a burst of activity (unknown for some time!) 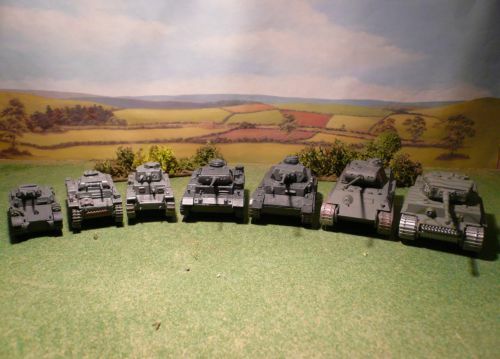 I have built and painted all of the outstanding Axis armour projects. 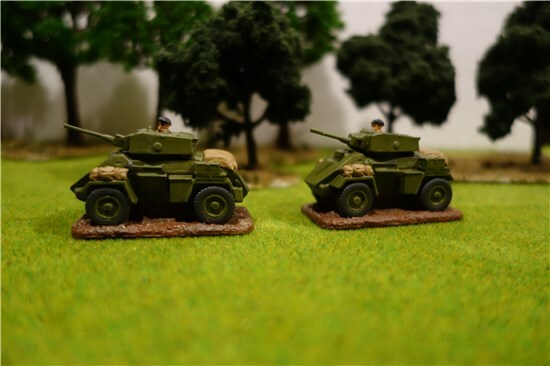 Left above are the Italian AB41 armoured cars built for the Sicily games. 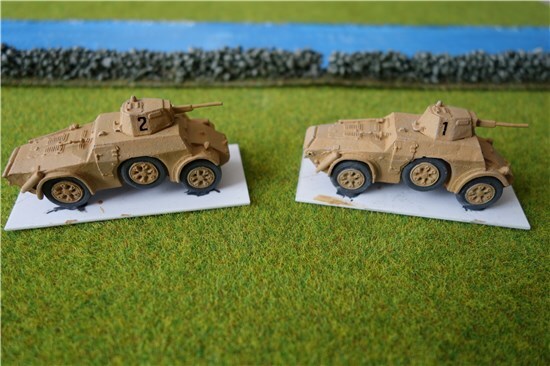 Centre - a pair of SdKfz 231 (8 rad) cars - built from SHQ white-metal kits and very heavy! I have a couple of crew members going through the painting cycle for these machines. 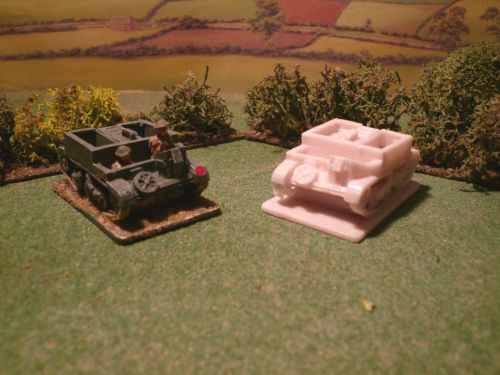 Right are the Semovente L40 47/32 vehicles. 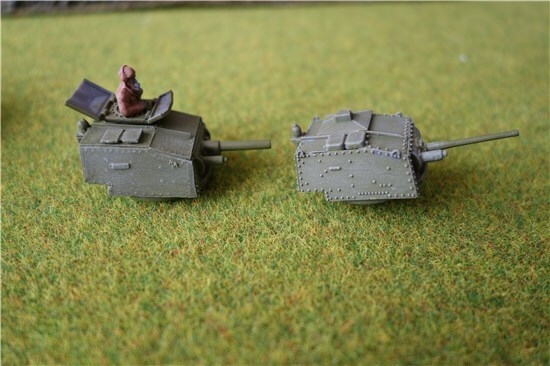 Italian armour was, on the whole, pretty rubbish but these self-propelled vehicles were a success. Again crew are being painted. All these models will need basing and a final coat of Games Workshop Purity Satin varnish (highly recommended) after the final painting details. 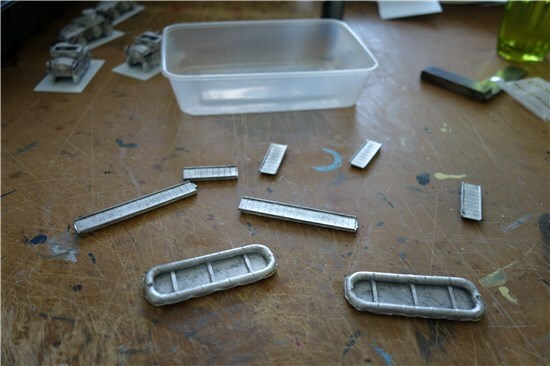 This series of photos show the development of a German pontoon bridging unit based around the SHQ whitemetal pontoon bridge kit. 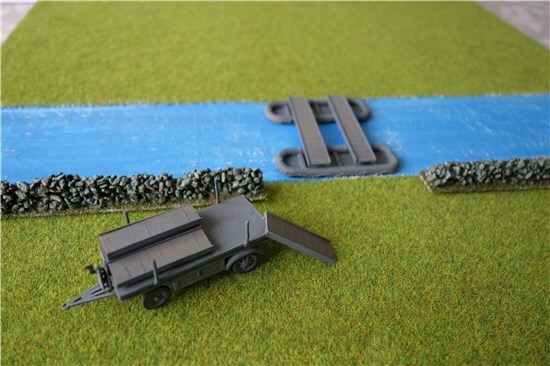 Top left shows the components of the SHQ kit and top centre shows plastic card copies of the bridging ramps. 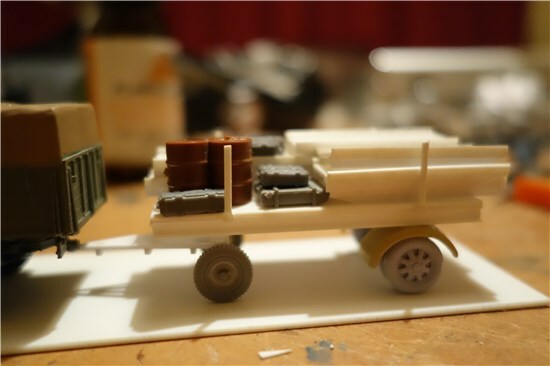 The trailer (top right) is scratch-built using just a couple of sets of wheels from the scrap box. Basic 40 thou sheet and various "Plasticstruct" shapes are used to create the deck and stantions. The canvas rolls were not used in the final scheme. 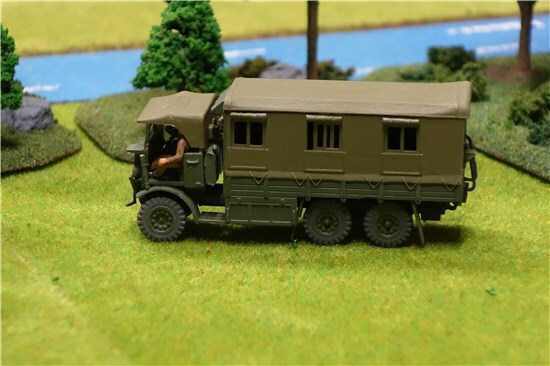 Bottom left shows how it looked after painting and bottom centre shows the loaded trailer and the SHQ kit together. In order to satisfy the Rapid Fire! pontoon bridge building rules, the bridging pieces had to be shown during construction. 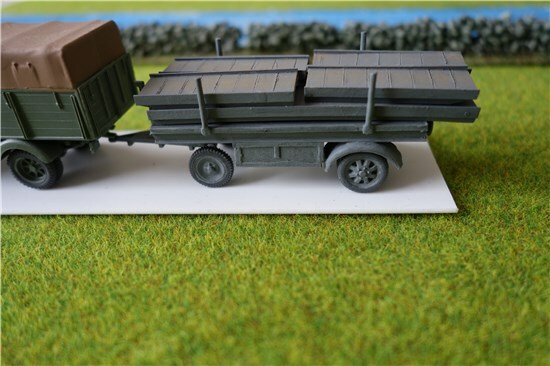 Therefore, whilst the SHQ ramps are glued together, the plastic ramps are separate and removable from the trailer. 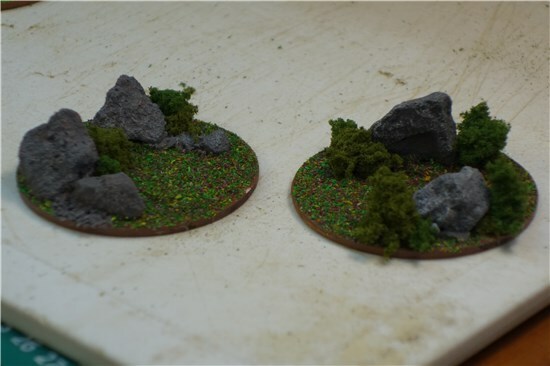 Above : More resin from the Ready To Roll boys at Rapid Fire! 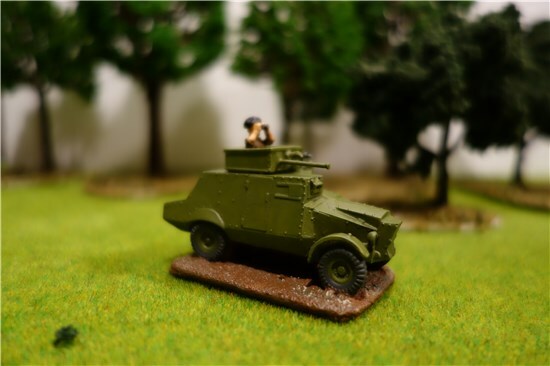 On the left, a Morris CS9 armoured car officer scans the area ahead and on the right, the commander of a Rolls Royce car consults the map. Both have been acquired for the Operation Sealion games that are planned. 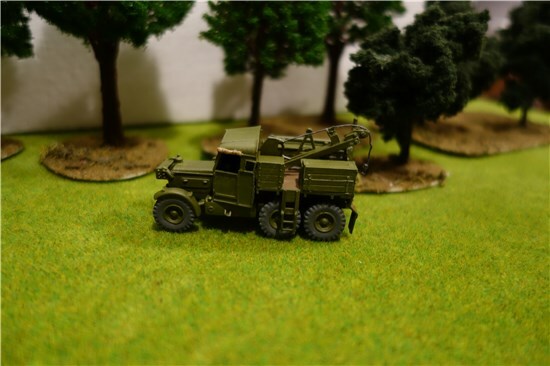 Above : This is the most complicated whitemetal kit I have ever made - an SHQ Miniatures model of a Scammell recovery truck. There are about 12 parts on the crane bed alone! 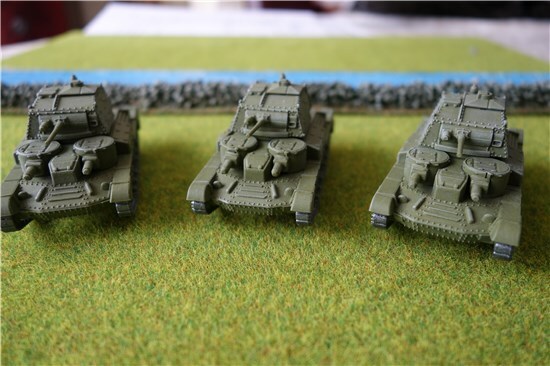 Buying equipment is one way of expanding your army but how about making it yourself? 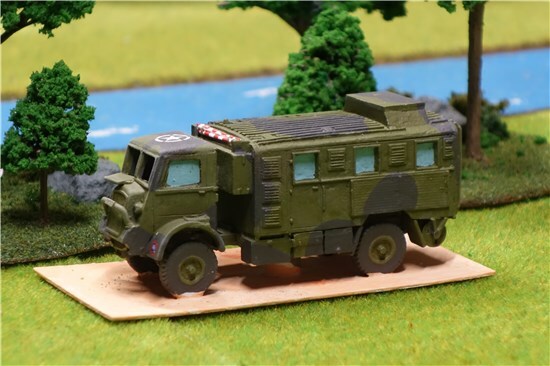 Strangely, unlike the world of railway modelling, wargame magazines never seem to publish plans or drawings of military equipment - why is that?? However, with a few library books, some research and a little inginuity, it is possible to make your own. These simple types of vehicles are a great place to start/experiment. 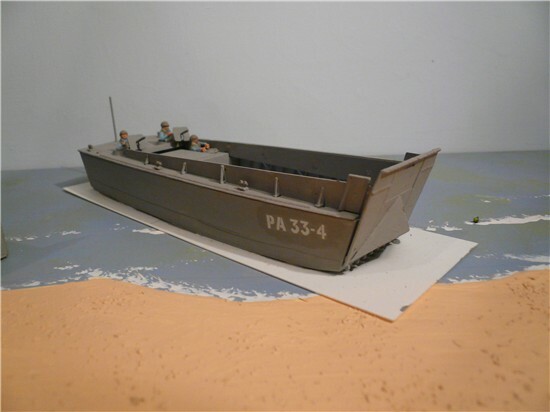 How about this - a scratchbuilt generic landing craft made from grey card. Many of the details here are simply drawn on with a black marker. Again, in the heat of a game (especially a solo one!) the lack of detail is not noticed. Net cost - virtually zilch so you could build a fleet of these for a full scale landing at little or no cost. Just to show that I do buy stuff as well (!) 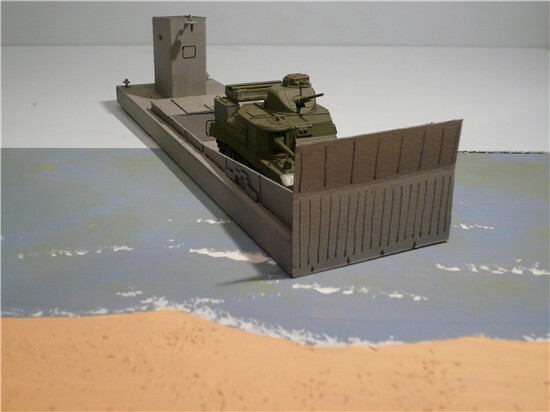 an Airfix landing craft on an as yet unfinished base. Not the best of photos - it was taken from a long way away by a German OP unit - a British 2pdr crew in a somewhat exposed position during the Operation Diamond campaign. 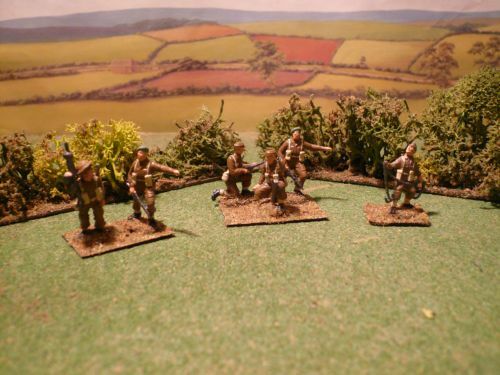 British Commando examples - (left to right:) a 2-man PIAT team, a 2-inch mortar crew and a figure with a grappling hook. 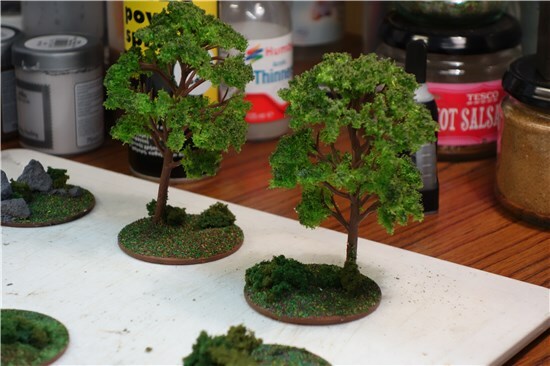 Resin models are a simple and easy way to add to your forces. 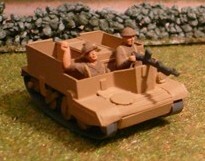 Here, a Bren carrier in its raw state and after painting. The crew come from the spares box with lower torsos removed to make them fit. 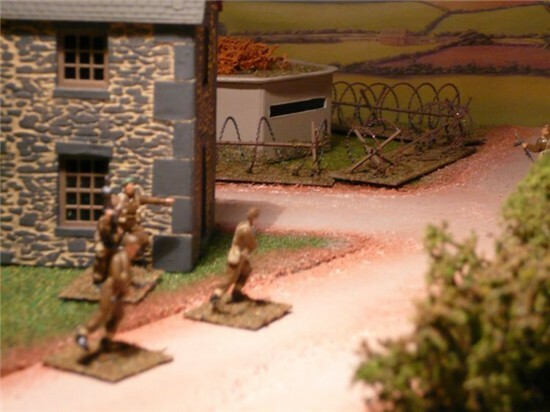 One of the features of a recent test game was a Commando raid at night. Here, in Cockleshell Hero style, Commando canoeists advance by the light of the moon. 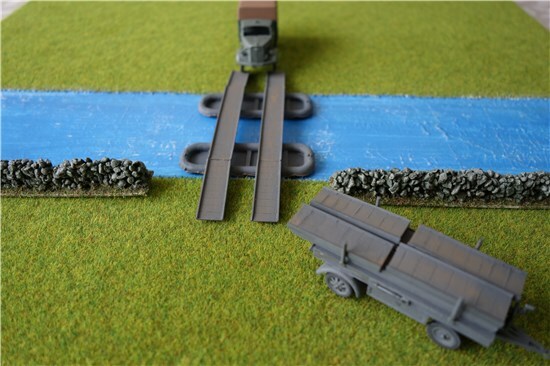 The river sections on the board follow the same idea as the road sections (see the scenery section of this site for details). 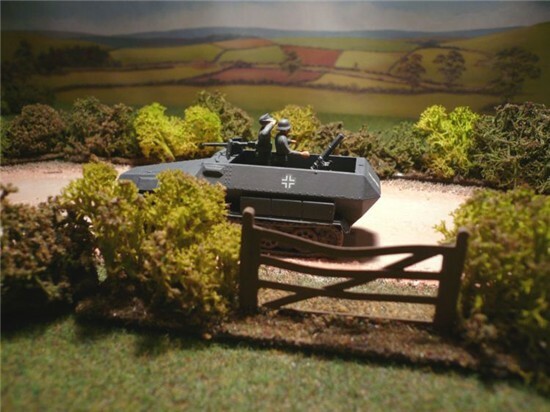 Seen under construction and in the paint shop earlier, here is the SdKfz 251 with 81mm mortar on the rear deck. The vehicle only has the capacity for a crew of 2 so the third man is assumed to be in the driving compartment. 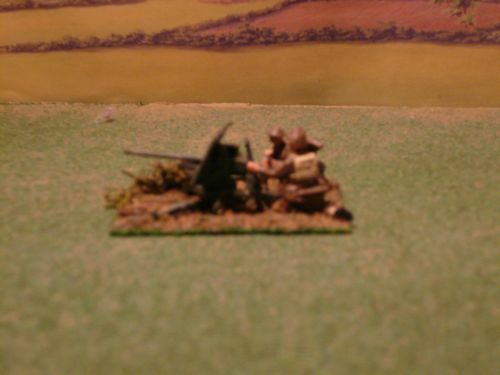 US M7 105mm self propelled guns (Priests) deployed during a game. The missing decals on the near machine have now been added. Left: Italian troops prepare the defences around the Radar station on Sicily during the Operation Husky campaign using FYOW rules. 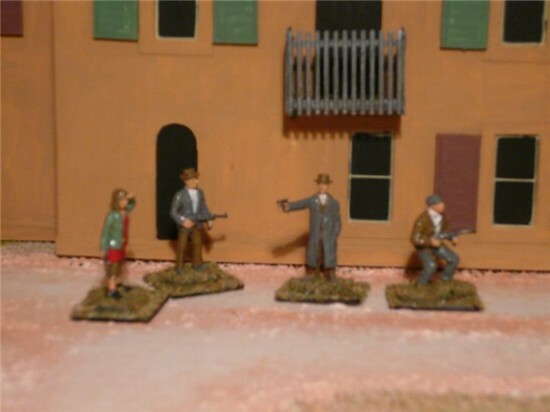 Right: Local partisans were included to add a little spice to the life of the defenders. Buildings scratchbuilt. 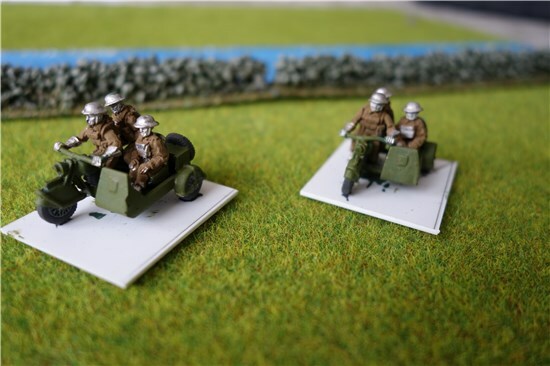 Below: Italian transport - resin models that produce good representations for the wargames table. 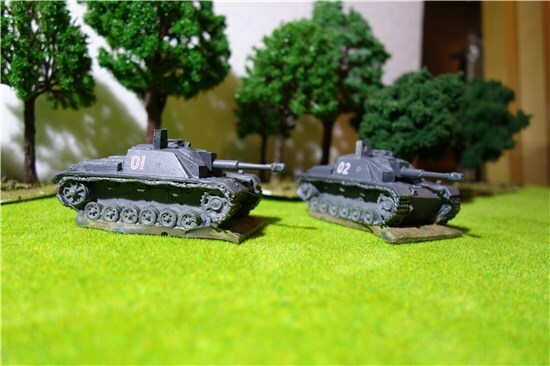 These are Minimi Models. 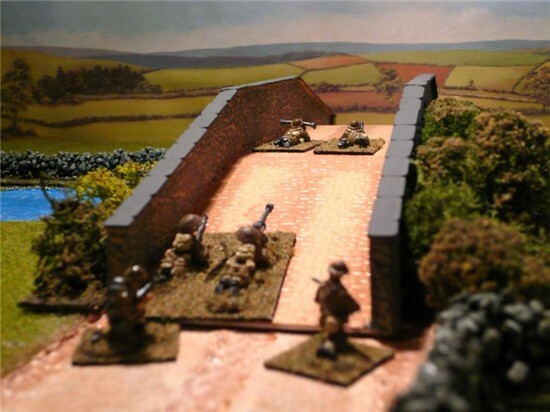 Above left: The British Commando force advances towards a strongpoint. Above right: The attack goes in. Buildings scratchbuilt. Germans in Sicily. 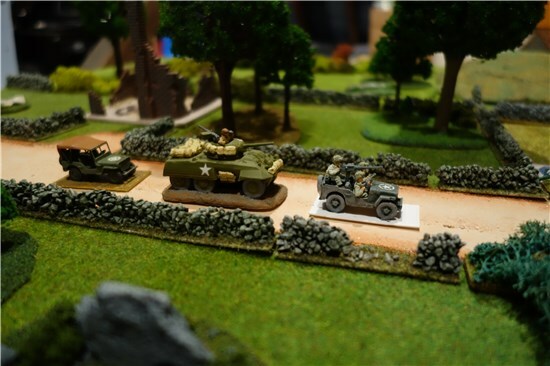 Left: Engineers make sure that the road is safe from mines before advancing and right: Panzerschrecke teams wait for the advancing US forces. 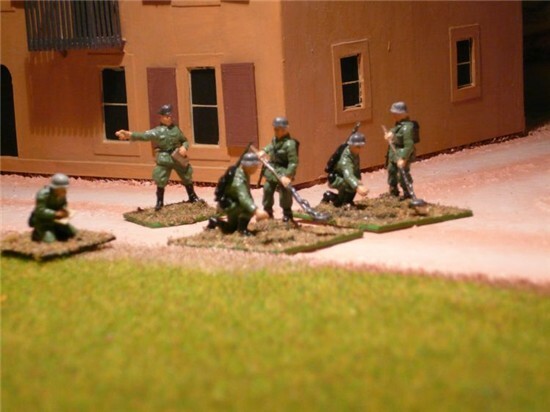 Above: A scene from the opening stages of the Operation Sealion campaign. 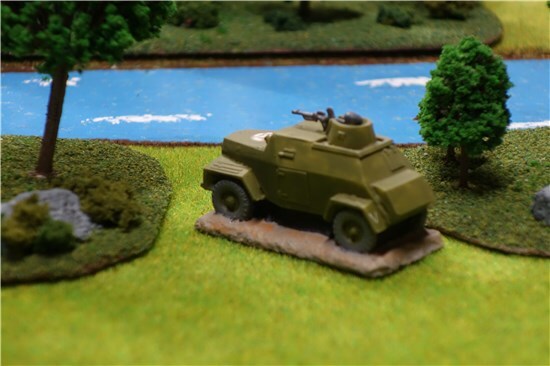 British troops guard a small river crossing with observation units watching the approaches. 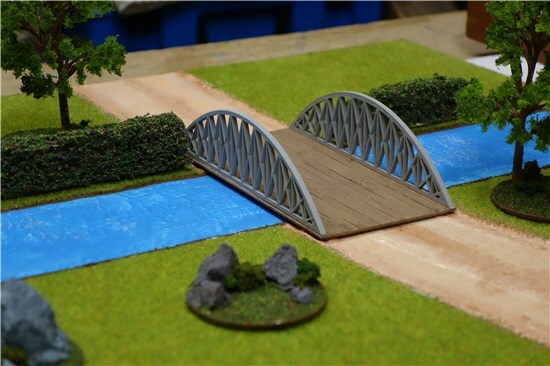 Bridge scratchbuilt.